Are you searching for a fun and distinctive way to help your child celebrate his or her next birthday? If you’re like most parents, you probably already have a hard and fast list of “must-have” features that the chosen venue must have to ensure that your little one has the special day that they deserve. At DuPage Swimming Center, we completely understand how vital picking the perfect party venue can be in the overall success of the day. That’s why we proudly offer a wide range of party plan options at our indoor Naperville pools. At DuPage Swimming Center, we know that you have an extensive assortment of choices when it comes to finding the perfect party place for your little one. That’s why we go above and beyond for parents using our indoor Naperville pools to celebrate their children’s next milestone. No matter what the age and interest of your little guests of honor, we are confident that we will be able to put together the perfect party plan for your child that will make the day special, fun, and memorable. What makes our indoor Naperville pools such a great choice for your next birthday celebration? It’s no secret that children of all ages love playing in the water. We offer two unique indoor Naperville pools so parents can select the best option based on the age and skill level of their party guests. Once you’ve selected which of our Naperville pools makes sense for your attendees, we coordinate your day so you’ll have one and a half hours of uninterrupted, exclusive use of your chosen pool. Having the water to themselves is a great way to start off your function on a fun vibe. Best of all, using our indoor Naperville pools means that you’ll never have to worry about planning a rain date; your festivities will proceed as planned, no matter what Mother Nature has in store for us. During your use of our Naperville pools, the team at DuPage will completely cater to you and your little guests. We provide various water toys and equipment so that every attendee can have a memorable experience. Our team can even help start and manage pool games during your session to further up the fun factor and help your attendees burn some party energy. 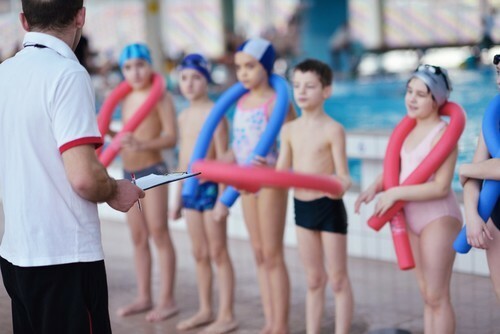 Most importantly, when using DuPage’s Naperville pools for your party, you can rest assured that your attendees are being carefully watched by our trained and skilled staff members. We offer certified lifeguards at every party who have also been trained in CPR and first aid. Your attendees’ safety is our top priority and we will carefully monitor every swimmer so you can enjoy peace of mind. Of course, no birthday party is complete without some of the traditional festivities that youngsters love. DuPage delivers here as well; we offer our party guests access to a private room after the swim session has concluded. Here you can enjoy food, cake, and presents as part of the comprehensive birthday party experience. Best of all, our team will manage cleanup for you once the festivities have ended, so you’ll feel like a guest at your child’s party yourself! Let DuPage help you plan your child’s next birthday party. Contact us today for more information on our party package!